I pulled out one of the stamps from last year's March Paper Pumpkin Kit for the sentiment of this card. 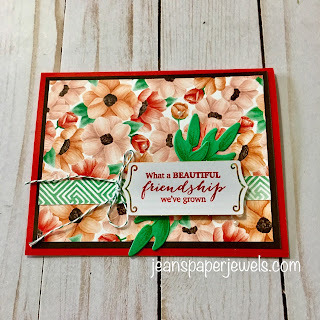 This particular sentiment fit one of the tags from our Share What You Love Embellishment Pack beautifully. That embellishment pack along with the Painted Seasons Stamp Set, and Designer Series Paper can be items that are FREE during Sale.A.Bration. I also used the pretty leaves from the Painted Seasons Framelits Dies Set. This set is part of the Sale.A.Bration Coordination products. We only have 5 days left for this year's Sale.A.Bration. Don't miss out! It all ends, March 31, 2019.